We offer a free initial consultation to discuss your case and will meet with you at your home if you wish. Have you been injured in an accident or because of a doctor’s negligence? If you have been hurt by someone else’s actions or because they failed to take measures to prevent injury, you may be entitled, to compensation. Your right to compensation may depend on the time it takes for you to make a claim, so don’t wait to get the legal advice you need. You have enough to worry about trying to recover from your injuries; turn the legal matters over to caring Solicitors who will work hard to get you the compensation you are entitled to. If you or someone you care about has been hurt in this manner, contact Maysons Solicitors today. 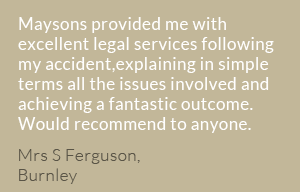 We offer a free initial consultation to discuss your case and will meet with you at your home if you wish.